I am so excited about launching this night in 3 weeks and am hoping it will become a regular thing... I've wanted to put on a night in London for quite a while but didn't really know where and when I could do it. While there are many great promoters and DJs in London putting on fantastic nights in large venues, I miss the days when you didn't have to plan to go to a great DJ/producer weeks ahead because after buying your ticket (which usually isn't cheap unless you catch some elusive early bird just as it takes flight), when you come to the night, maybe you're tired, maybe you're ill or something has come up or you just don't feel like a big night out... And then there are nights when you feel like a big night out, you feel like going on a techno journey but there's nowhere to go because so many of the old reliable clubs have closed their doors and you didn't buy a ticket to anything that's on but you're scared of going because there might be a long queue and you might not get in despite the effort. I miss Plastic People and the End in particular but basically I miss the days in this town where you could spontaneously fall down the stairs or up the stairs into a blank space filled with amazing music and people who are genuinely there for that (not because it's cool) and it's no big deal. The DJs are not necessarily super famous but they're damn good and they will share their magic to take you with them on a beautiful journey through an amazing sound party with your friends, old and new. I had this vision and the place I saw it happening in was BAR A BAR, a fantastic little club in Dalston. 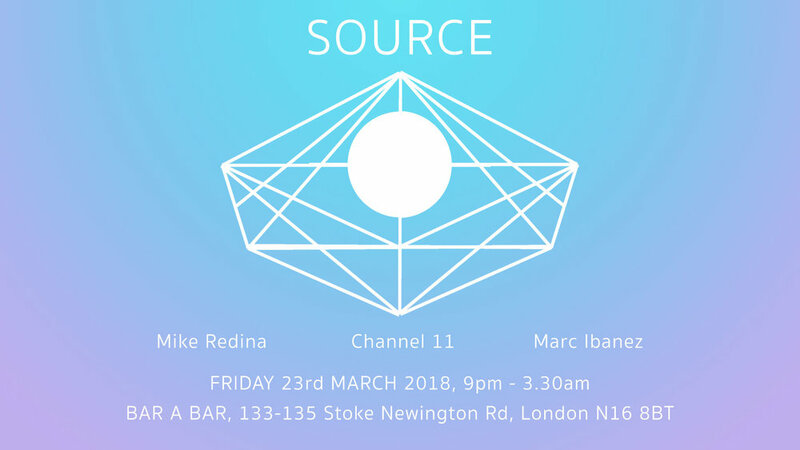 I had been there a while back and remembered loving the vibe and the sound system and so, was over the moon when I contacted them and found it would be possible to launch SOURCE there. There is honestly no better place it could be happening in this city and just so grateful to the manager for allowing it. I am also so happy to have two amazing DJ friends, agreeing to join the lineup for the night, both of whom have been so supportive along my Channel 11 journey. Mike taught me how to DJ a couple of years ago and Marc gave me a much needed final push to just get or call the album finished and lose the fear of sending it out there last August. Both of these guys are seriously talented and it is an honour to have them playing at SOURCE in the first place but for these personal reasons, it is all the more significant and cannot wait to hear their sets! All details and links available here.